For the life of me, I could never understand why Gloria always chose the bran muffin when she had an entire cafeteria to choose from! Gawd… she didn’t even have to ask – she was a grown up! She could have had anything she wanted, yet she always chose a dry, shriveled, raisin infested “healthy” muffin. Me, of course, I chose the green jello, with the dollop of whipped cream on top, as I always did. And as I watched her pick away at her pathetic little muffin (she didn’t even eat the whole thing!) while I savored every last bite of that green jello, I felt only pity for her. We weren’t allowed jello very often and my Mom never made it at home. She said it was unhealthy and full of sugar. So whenever we went out and I got the chance to eat jello, I went to town! My kids always wonder why I never make jello and as you can guess, it’s for the very same reasons. 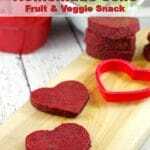 Then I made them this Healthy Homemade Jello Fruit & Veggie Snack (Gluten-free)! One of my highlights of being a kid was hanging out with my Mom – just her and I. But what was even more exciting than that was when we would meet one of her friends or relatives for lunch or coffee downtown. We didn’t do it that often, but when we did it was pretty darn exciting! If I’m going to serve them jello, it’s going to be healthy! And this is so tasty that they don’t even notice it has spinach in it. And if they do notice, it’s so good that they don’t seem to care. They’re just happy to have jello in the house that I actually let them eat! 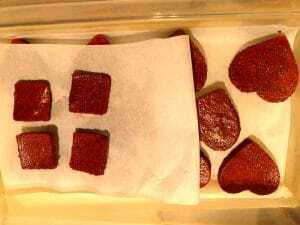 I cut them into hearts for Valentine’s Day, but you can cut them into squares or any shape you desire. I guess Gloria must have worked downtown because we met her for lunch or coffee at The Bay downtown cafeteria. Gloria was my Mom’s cousin’s wife. And as a kid, I thought she was really nice, but also a little crazy when it came to food choices. However, as an adult, I get Gloria. Besides salad, bran muffins were probably the healthiest thing you could get at the Bay cafeteria back in the mid 1970’s. So Gloria was simply doing what I, and the majority of other health conscious adults do, most of the time. 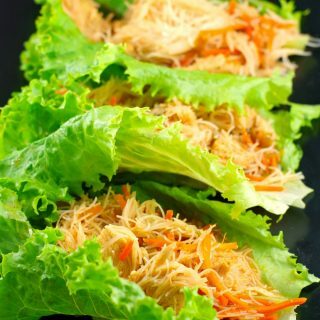 Although they are pretty used to it by now, my kids are also often stunned that I do the same thing; I’ll opt for something healthy and light in a restaurant when I can have anything I want! But we all know by now that nature is cruel. And by the time you grow up and can have anything you want, you actually can’t have anything you want. That is, unless you are prepared to accept the consequences that accompany those unhealthy choices. I can’t remember the last time I ate green jello and honestly have no desire to ever eat it again. Not only do our palates evolve, the onus of responsibility for how we eat shifts from our parents to us. However, I WILL eat these homemade healthy jello fruit and veggie snacks! 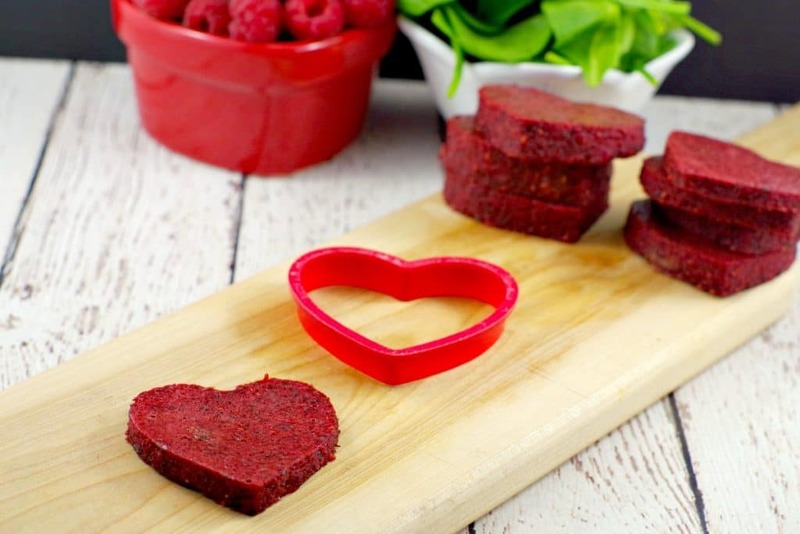 They taste so good that you don’t even realize they are healthy AND they are only 1 Weight Watchers Freestyle Smart Point per heart. 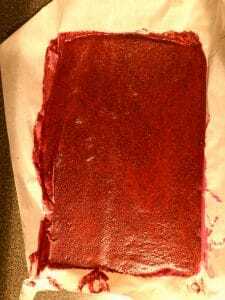 Store bought Jello is loaded with sugar, artificial flavor and artificial color, where as this gets all its flavor from real fruit and veggies and is packed with vitamins and minerals. And I always use Agave, which is a natural sweetener. I notice that my kids also go to town with the green jello whenever we go to any kind of buffet or cafeteria. I just sit back, smile, let them enjoy this time in their lives and remember Gloria and my good ol’ jello days. 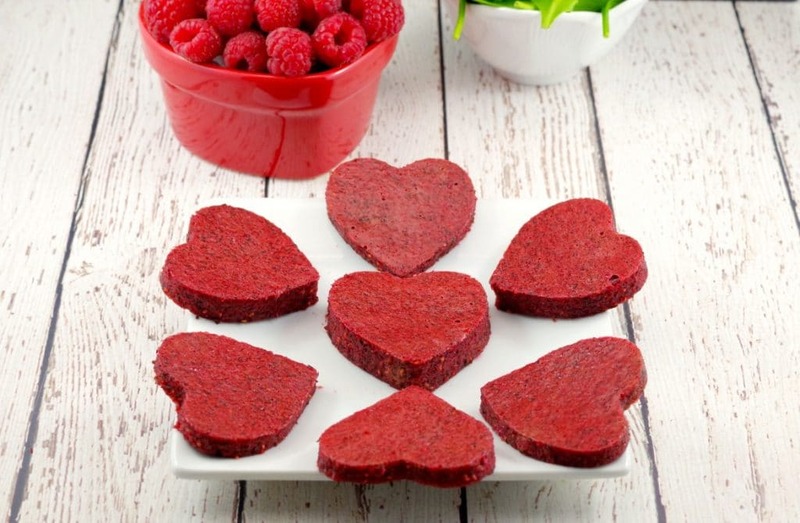 So if you’re tired of the sugar overload during Valentine’s Day, these cute Valentine homemade jello hearts are the perfect healthy snack for a kid’s Valentine party, potluck or lunch bag. But they’re really great all year ’round – you can cut them into any shape. Remember- hearts aren’t just for Valentine’s day! 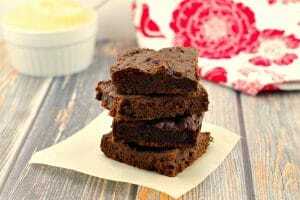 If you’re looking for additional healthy recipes your kids will LOVE, then check out these Healthy Applesauce & Spinach Brownies! Author Slightly altered from The Stay at Home Chef's "Homemade Fruit & Vegetable Snacks"
* Heads up! There is a 2 hour refrigeration (setting time). Pour juice, spinach and raspberries into food processor. Blend until smooth. Pour berry mixture into a saucepan. Add in agave, vanilla, and gelatin packets. Heat over a medium-high heat until gelatin is completely dissolved (3 to 5 minutes). Line a 9X13 inch baking sheet with parchment paper. Pour fruit mixture onto pan and spread evenly with spatula. Bang on counter to remove any air bubbles and even thickness. Cool for 10 minutes. Refrigerate for 2 hours until set. 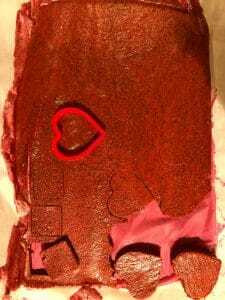 Cut into heart shapes (or other desired shapes) and serve. Store in the refrigerator, stacked between sheets of parchment paper, in an airtight container for up to 2 weeks. Previous Post: « Chinese Potstickers (Dumplings): Happy Lunar New year! My parents made jello (or jelly as we called it) every Sunday when I was growing up. And it wasn’t the healthy kind! Love that you healthified (is that a word?) a childhood treat! Healthified is totally a word, Leanne 🙂 You are so lucky to have had that as a kid – jealous!